What's a nice church like this doing in the middle of Times Square? The official history of the Church of Saint Mary the Virgin begins on December 3, 1868, when the incorporation certificate for The Society of the Free Church of Saint Mary the Virgin in the City of New York, constituted under the state’s Free Churches Act, was accepted for filing by the New York State Supreme Court. The official history has to do with paperwork, but the real history of our parish can be said to have begun at the University of Oxford on July 14, 1833. It was on that day that John Keble, a priest and Oxford scholar, preached a sermon at the University Church of Saint Mary the Virgin in which he accused the Church of England of having lapsed into apostasy. The sermon and the ensuing issuance of the “Tracts For The Times” written by Keble’s associates, most famous among them John Henry Newman, called on the Anglican Church to reclaim its Catholic roots and to resist interference by the State. The Tractarians, as they were called, raised a storm of enormous controversy in the Church of England. Since the 16th Century when King Henry VIII declared himself head of the Church in England (thereby avoiding direct oversight of the Pope) the Church of England officially still retained the traditional Catholic sacraments. Especially important among Catholic traditions was the apostolic succession of its bishops, that is, the notion that a primary symbol of the Catholic Church is its bishops in a line unbroken from the Apostles. The acts of Parliament that declared the Monarch, not the Pope, to be the Supreme Head of the Church in England addressed an institutional dispute between the Crown and the Papacy but did not create a new church. Yet most Anglicans had little interest in exploring this ambiguity, and most in England and later in the Episcopal Church in the United States, easily considered themselves Protestants. By the late 1800’s the Anglican Church had survived a stormy and often violent history; having finally achieved a calm that some thought fell short of the demands of Christian discipleship. The Tractarians argued that to recover its faith, the Anglican Church must recover its Catholic heritage. This spirit drew adherents among the clergy and laity on both sides of the Atlantic. One of those clergy was a young priest named Thomas McKee Brown, whose vision was to build a church in New York City dedicated to expressing the full witness of Catholic thought in ritual and teaching within the Episcopal Church. Brown, at 25, was ordained to the priesthood in 1866 by the Right Reverend Horatio Potter, VI Bishop of New York, and for the next four years Father Brown served as curate and rector at churches in the diocese. While serving other parishes, his vision for a particularly Catholic parish only grew in intensity. A year after his ordination, Father Brown brought his plan to Bishop Potter, who suggested that a church was needed near Longacre Square on the west side of what is now Midtown. [Longacre Square was renamed Times Square in 1905 when the New York Times competed its building at 42nd Street and Broadway.] Experiencing one of the strokes of fortune that has followed Saint Mary’s through its existence, John Jacob Astor offered to give Father Brown three lots on West 45th Street between Seventh and Eighth Avenues, “stipulating that the Church should be free, and positively orthodox in management and working.” That a church might be a “free” church meant that parishioners would not have to pay pew rents, which made an immediate social statement. The Church of Saint Mary the Virgin was located at 228 West 45th Street from 1870-1895. Father Brown accepted the offer and the church’s cornerstone was laid with appropriate ceremony at 228 West 45th Street on April 6, 1868. [Currently, this is the site of the Booth Theatre.] Later the same year, Father Brown and seven associates signed and filed the incorporation certificate. To make sure that there was no mistaking their intentions, they named their parish for Saint Mary the Virgin, the Blessed Mother of Jesus, openly challenging one of the uglier anti-Catholic prejudices of the day, and making no mistake that this was to be an Episcopal Church in the full Catholic Tradition. Father Brown and his followers spent the next two years raising money to build the church. It was dedicated, and Father Brown was installed as its rector on December 8, 1870, the Feast of the Conception of the Blessed Virgin Mary. Bishop Potter was unable to officiate at the service (there are indications that his views on Saint Mary’s were somewhat ambivalent, if not negative) and his place was taken by the Right Reverend Horatio Southgate, the Episcopal Church’s former missionary bishop to the Ottoman Empire. Although money continued to be a problem (a recurring drama throughout Saint Mary’s history), Father Brown spared no expense in celebrating the Eucharist with full ritual, including a choir of 40 voices and a small orchestra. At a time when the principal service in Episcopal churches was Morning Prayer with the Eucharist only celebrated four times a year, Father Brown, heeding the Tractarian view that “it is the Mass that matters,” moved quickly from celebrating the Eucharist every Sunday to celebrating it every day. To the followers of the Tractarians, the Eucharist was the Church’s response to Christ’s commandment at the Last Supper, to “do this in remembrance of me.” The Eucharist invoked the essence of the faith: Christ with us, then, now, forever and as such should be kept with solemn ceremony. In all of this, Father Brown expended enormous energy on his parochial duties to his parish. He built a school, founded an order of nuns, the Sisters of the Order of the Visitation, and installed them in the church to help care for the needs of the parishioners. The west side of Midtown in those days was a populous neighborhood of brownstones. The parishioners were not poor, but this being pre-pledge days, and pew rentals being forbidden, the collection plate and the generosity of the trustees were the only source of an unsteady income. The choir in the Church on 45th Street in the 1870s. So successful was Father Brown that by 1890, the congregation had outgrown the church on West 45th Street. Then came another stroke of fortune. The trustees’ minutes for 1892 note, “The Treasurer reported that the late Miss Sara L. Cooke, a member of this parish, had made the church her residuary legatee.” The legacy eventually would amount to several hundred thousand dollars, in addition to real estate. Where many parishes would have banked the legacy and stabilized their financial life from its income, Father Brown and the other trustees began to look to Miss Cooke’s legacy as the means to building a larger church in the parish. By 1893, the trustees had authorized a search for an eight-lot block of property on the east side of Broadway. By year’s end, the trustees’ agent reported the likelihood of obtaining a site “on 46th and 47th Streets, midway between Broadway and Sixth Avenue for about $200,000.” The trustees authorized him to obtain an option on the lots. Within six months, an eight-lot parcel running through from 46th to 47th Streets had been assembled, at a total cost of $220,000. The present Church of Saint Mary the Virgin being built in 1895. By April of 1894, the trustees had arranged for disposal of the first church. William Astor, John Jacob Astor’s son, insisted on paying the parish the fair market valuation of $76,000 for its return of the land his father had given Saint Mary’s for free. Father Brown and the trustees began planning for their new church. They decided that the style would be French Gothic, “interior to be lofty,” with seating for 800 persons. In addition to the church, the plans included construction of a Rectory at the 47th Street end of the lot, and a Clergy House (for curates and assistants) and a Mission House (for the Sisters) flanking the entrance to the church on 46th Street. The entire project was not to exceed a cost of $200,000. By May, the treasurer reported that the receipts from Miss Cooke’s legacy had exceeded $700,000. About the same time, the trustees hired the architectural firm of Napoleon LeBrun & Sons to build the new church. The contractor, John Downey, a Presbyterian who had built the former Saint Mary’s building, signed on again to build the new church. By October, LeBrun was back with plans for the entire project and they were accepted by the trustees. In order to place all the buildings and a church with a lofty interior on the lot, the trustees accepted LeBrun’s recommendation to consider a new construction method never before tried on a building of such size. Rather than use masses of stonework to support the walls and roof, the church would be built around a skeleton of iron beams that would bear the weight but create little bulk. Cut stone would be used for the exterior of the church but only for the parts that were visible from the street. Brick would be used for the work that would be obscured by the other buildings in the cluster. 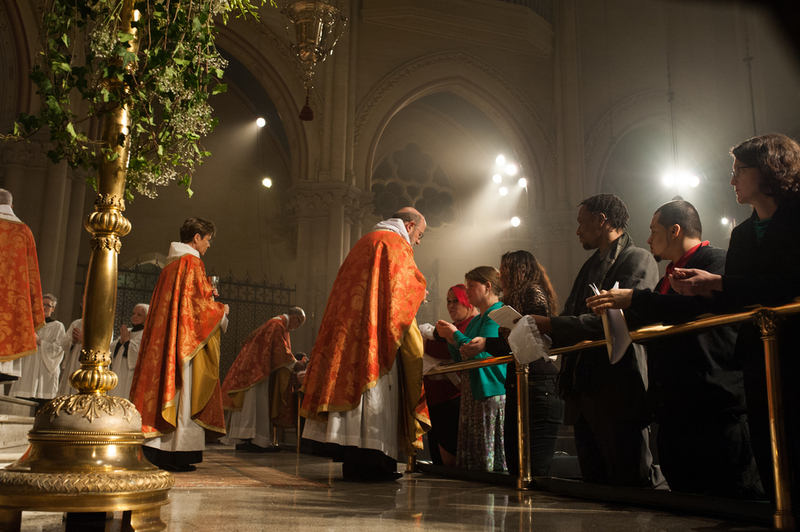 Exactly one year later, in a blaze of liturgical ritual never before seen in an Episcopal Church, if contemporary accounts are to be believed, the new Church of Saint Mary the Virgin was opened with its first Solemn Mass, with Father Brown as chief celebrant. Admission was by ticket only, and a squadron of police was dispatched to 46th Street to keep order in the crowd of hundreds of persons who had gathered outside. Bishop Grafton returned and Bishop Potter’s absence again was remarked on in the newspapers. Nevertheless, four days later, on December 12, Bishop Potter consecrated the new church and accepted the Instruments of Donation from Father Brown, whose vision to keep the Catholic faith “in the beauty of Holiness” had been realized. Father Brown died on December 19, 1898 of pneumonia, having served as priest for 32 years, all but four of them as rector of Saint Mary the Virgin. The neighborhood around Saint Mary’s began to change drastically after Father Brown’s death. Many of the theatres moved uptown, the subway system was opened, the brownstones began to be replaced by hotels and office buildings and gradually the residential population of Times Square moved elsewhere. During the 1960’s and 1970’s the rectors and trustees did well simply to keep Saint Mary’s open, a Catholic witness in the midst of a sometimes dangerous and harsh part of Manhattan. The social aspect of Anglo-catholicism has always been a part of Saint Mary’s. Yet, because of the difficulty of the neighborhood, for some years the Mission house was occupied by a series of non-profit agencies, some more connected to the parish than others. At the beginning of the 21st century, new signs of growth and energy in the parish have led us to begin to discern ways in which our Mission House might best served the parish in the future. People have begun to move back to Midtown and many new businesses have relocated here. The Most Reverend Katharine Jefferts Schori, 26th Presiding Bishop of the Episcopal Church, celebrating Mass on the Feast of the Annunciation at Saint Mary's. Our parish continues to redefine diversity and inclusiveness. We do this through the quiet and almost subtle process of simply being ourselves. As members of the parish, weekday friends, neighbors from other churches who join us on feast days and our national and international friends who worship with us when they are in New York, we are families and single persons, young and old, black, white, Asian, Hispanic, gay, straight, conservative, liberal, and certainly a few who would define themselves as “post-labels.” We are a part of Saint Mary’s because the worship grabs us and changes us. We see the Body of Christ in the Sacrament of the Altar and in the faces of those around us. If you visit us, know that we will be looking for the risen Christ in you, as well.